Canada's security and economy is dependent on effective joint border management. The impacts during and following an emergency could be widespread, causing significant and measurable disruptions (for example, border congestion, restrictions or closures) to the normal cross-border movement of people and goods at Canada and United States (US) ports of entry. To ensure readiness for the unknown, government departments/agencies have collaboratively developed this Plan for the Movement of People and Goods During and Following an Emergency (Plan) in consultation with the national Chamber of Commerce, private sector and other internal and external stakeholders. This Plan includes two distinct but interdependent functions. The first function is a triage methodology to assist the Government of Canada to establish which people and what goods are most urgently needed in Canada and should move through the border on a priority basis. The second function is the process of communicating with stakeholders, not only to receive key information to be considered in the triage function, but to communicate the decisions of government. The second function also includes the opportunity to provide additional feedback between the parties through two-way communication as the event unfolds, even during an extended period. This Plan also includes a supporting traffic framework function essential to the Plan's success during activation as guidance to governments, public and private sector stakeholders for the physical movement of prioritized people and goods to and away from the border. Note: The process will not include a pre-established list of priority people and goods because, until the event occurs and the impact, breadth and depth of the disruptions are known, it is not possible to determine what the immediate and collective needs of the country will be during and following the emergency. This Plan, endorsed and approved in 2009 as an annex to Canada's Federal Emergency Response Plan (FERP) under the Emergency Support Function (ESF) for Border Services by the Assistant Deputy Minister Emergency Management Committee (ADM EMC), is an evergreen document subject to updates as required. The FERP ESFs represent response actions that are designed to address specific issues that could arise prior to, or during, an emergency. The implementation of this Plan would be carried out in conjunction with all other ESFs that are activated to respond to a given emergency, including the Public Communications ESF. The process will focus on the Canada-US land border, but will be flexible enough to apply in principle to the marine, air and rail modes of transportation. The process must be undertaken in concert with the activation of the Border Services ESF and other departments'/agencies' ESFs under the FERP. The process will not include a pre-established list of priority people and goods because, until the event occurs and the impact, breadth and depth of the disruptions are known, it is not possible to determine what the immediate and collective needs of the country will be during and following the emergency. The process must acknowledge, consider and complement any existing legislation, regulations, agreements, guides, processes and Memoranda of Understanding that federal departments/agencies, provinces and territories have in place, including those related to traffic management. The process must address concerns that the state of readiness for border restrictions differs across provinces/territories. The process must be consistent with the North American Avian and Pandemic Influenza Plan, as well as other existing Canada-US coordination protocols. Canada must collaborate with the US to promote mutually compatible measures at the border. Under the Security and Prosperity Partnership initiative 9.2.7, the Canada Border Services Agency (CBSA) worked with the US Customs and Border Protection (CBP) and established the Canada-US border resumption plan [(2007 Joint CBSA/CBP Business Resumption Communication and Coordination Plan (CCP)] for use in the event of an incident or threat that has the potential to cause, or causes, significant and measurable disruptions to the normal cross border flow. The CCP formalized the process for timely communication and consultation between the CBSA and CBP during emergencies to assist in the resumption of normal border operations on both sides of the land borders as quickly as possible following an event. A key component of the CCP is the Unified Business Resumption Messaging (UBRM) web tool. Public access UBRM information postings by the CBSA and CBP will occur during an event that has the potential to cause, or causes, significant and measurable disruption to the normal cross-border movement of people and goods to provide private sector stakeholders and the general public with access to alerts. All UBRM messages will be developed by CBSA and CBP in coordination with each other, and posted simultaneously on their respective web sites. The CBSA UBRM can be accessed at the following public site: http://www.cbsa-asfc.gc.ca/eo-ou/menu-eng.html. The CBP UBRM can be accessed at the following public site: http://www.cbp.gov/newsroom/news/advisories/ubrm. This Plan was created under the auspice of the CCP. The CBSA, Public Safety Canada (PS), CBP, other federal government departments/agencies, Chamber of Commerce, private sector and other stakeholders collaborated to ensure that mutually compatible measures were promoted to respect the communication and prioritization process for managing the flow of goods and people across the Canada-US border during and following an emergency. This Plan supports and will be supported by the Canada – US Framework for the Movement of Goods and People Across the Border During and Following an Emergency, which was announced by the Minister of Public Safety Canada and the US Secretary of Homeland Security in 2009. 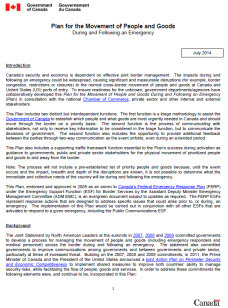 In 2012, PS and the US Department of Homeland Security announced the Considerations for United States - Canada Border Traffic Disruption Managementdocument. The document is designed to support the efficient flow of goods and people to and away from the border by providing border management stakeholders with a checklist of key partners to engage and important issues to consider when developing or updating existing traffic management plans. The Director General Border Management Working Group, hereafter referred to as the DG Working Group, was formed based on a recommendation from the ADM EMC. The DG Working Group is made up of federal government departments/agencies that have a vested interest in the movement of people and goods across the border and is co-chaired by PS and the CBSA. The DG Working Group was originally tasked with developing the process to prioritize the cross-border movement of people and goods during times of crisis. Developing a stakeholder engagement and public communications strategy to ensure clear, effective and consistent communications from the Government of Canada to domestic and international stakeholders and the public during and following an emergency. The criteria used to identify essential goods and people are flexible enough to adapt to various emergency situations and applicable to circumstances that cause a significant and measurable effect on the flow of cross border trade. These situations might include a 9/11 scenario, pandemics, natural disasters, and/or increases in security alert levels. Outreach and awareness activities with stakeholders to promote and share the Plan and encourage similar and complementary local level initiatives. ADM EMC regarding which goods/people should move to and away from the border on a priority basis, based on the collective needs of the country. This can include, but is not limited to, emergency vehicles, emergency responders and medical personnel. These activities will be undertaken in concert with the activation of the Border Services ESF and other departments'/agency's ESFs under the FERP. The command, control, and coordination of identifying the urgency of the need for certain people and goods at the time of an emergency is consistent with the concept of the Incident Command System which provides a way of coordinating the efforts of resources as they work together toward safely responding to an emergency event. Decisions will be made from a national perspective but the decisions will be disseminated regionally/locally (Appendix A). The DG Working Group will be convened by the co-chairs (CBSA and PS) within 24 hours of an emergency that results in major border congestion. Other representatives not identified in this Plan may also be invited to participate, depending on the nature of the event. As illustrated in Appendix B, private sector stakeholders who wish to apply for priority assessment for their category of goods/people may do so by completing the Application for Priority Assessment in the Course of an Emergency Event and submitting it to their sector lead government department/agency. Sector lead departments/agencies are responsible for the Applications received from respective stakeholders; this includes triage and information management. The sector lead department/agency may ask for additional information, but the information that is contained in the Application should be completed as a minimum. The Application process is designed to assist private sector stakeholders and the Government of Canada in assessing and communicating the relative priority of people and goods during and following an emergency. The Application contains fields for private sector stakeholders to populate, which will then be used during the assessment of national priorities. National priorities during the first 24 hours immediately following an emergency event will be set by the Government of Canada based on the critical needs within Canada. Included in the Application is a column entitled “Needed Within” which allows for private sector stakeholders to identify when the people and/or goods need to be received in Canada (0 hours – 2 weeks), from the time the Application is submitted. Based on the evolution of the emergency and the needs within Canada, multiple opportunities may exist for private sector to submit completed Applications identifying potential new or updated priorities to their respective sector lead federal government department/agency. It should be noted that, during a major border disruption, the triage process will not be applied to pre-approved low risk travelers and trade as these groups will continue to flow through the border as per the expedited conditions of each respective program. These pre-approved groups include but are not limited to NEXUS, Free and Secure Trade, Customs Self-Assessment and Partners in Protection. Interaction and partnership with key government and private sector stakeholders is imperative during a time of emergency. Notification that this Plan has been activated will be carried out in accordance with established engagement strategies. A regularly updated contact list identifying DG Working Group members and alternates will be used to ensure seamless communication. A standing teleconference line has been established and is available on a 24-7 basis. During an emergency situation when the DG Working Group needs to convene expeditiously, the co-chairs will contact the other members with the time to dial in for a conference call. The DG Working Group will maintain communication with the Government Operations Centre regarding the Plan's activation. The Government Operations Centre will continue to liaise with departments/agencies and other stakeholders as per its responsibilities under the FERP. Federal government departments/agencies will communicate with each other and their respective key stakeholders during an emergency using pre-established communications trees. The top line of each communications tree will receive direct communication from the sector lead department/agency. The communications will be phone based when possible (supplemented by other mediums as required) to allow for two-way communications. However, each sector lead department/agency may use their own communications mechanisms to contact their stakeholders (and vice versa). Communication may include, but will not be limited to, information about the event, priority people and goods, immediate and possible longer-term impacts, and instructions. It is imperative that the stakeholders identified in the first line of the communications tree represent all modes of border traffic, including commercial and travelers, and have the capacity to reach out to importing and exporting community as a whole. The stakeholders identified in the first line of communication represent the vast majority of users of borders/trade infrastructure and can reach out to those businesses directly affected by the event. Each stakeholder in the first line will then be responsible for fanning out the information to their predetermined list of members. With the activation of this Plan, emphasis will be placed on the identification of essential goods and key people that need to enter into Canada in a timely manner during and following the emergency. The CBSA's UBRM (http://www.cbsa-asfc.gc.ca/eo-ou/menu-eng.html) web tool may be activated during an emergency, to quickly and efficiently provide information to stakeholders. This information will be as comprehensive as possible and will involve the status of delays. Once the priorities have been established, the Communications Trees and Stakeholder Engagement and Public Communications Strategy will be used by each sector lead department/agency to disseminate the results to the appropriate public/private sector stakeholders. Local/regional border management stakeholders can then use existing traffic management plans, procedures and protocols to facilitate the flow of the priority goods/people to and away from the border. As identified in the FERP, PS is responsible for ESF #12 (Public Communications). The objective of ESF #12 is to ensure that Government of Canada departments and agencies work collaboratively to achieve coherent and effective communications with the public, as well as their partners and stakeholders, during an event. The activities of ESF #12 include the coordination of information on behalf of the Government of Canada to inform the public, interact with media, share information with stakeholders and coordinate information-sharing among federal, provincial/territorial and international partners. In keeping with the all-hazards approach found in the FERP, the Public Safety Communications Directorate applies one operational approach to all events. Strengthened resilience of critical infrastructure by minimizing supply-chain disruptions for essential goods and people during times of crisis. The prioritization process and communications networks outlined in this Plan have been validated via exercises and will continue to be tested on a regular basis through tabletop exercises. Sector lead government departments/agencies will validate their respective Communications Trees on an annual basis and develop internal exercise plans related to their respective communications trees. This evergreen Plan will be updated as required to reflect new/updated information, lessons learned during exercises, as well as lessons learned from actual real time events. 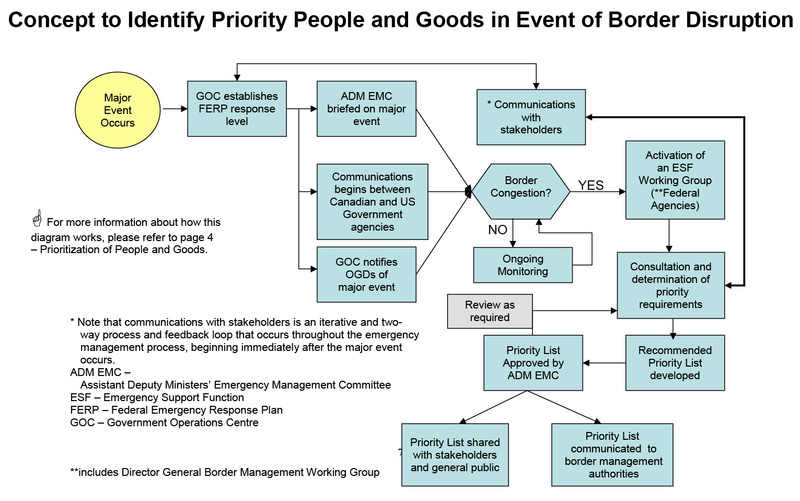 Image one illustrates how the list of people/goods urgently needed in Canada would be established and communicated to stakeholders in the event of an emergency situation involving significant border congestion [that results in the activation of the Border Services Emergency Support Function under the Federal Emergency Response Plan (FERP)]. It presents a flow chart with 15 labeled boxes that are linked by arrows. The chart is multi-directional. At each step, arrows point forward to one or more boxes. In order for the Government of Canada to make informed decisions regarding the prioritized movement of people and goods across the border during and following an emergency, private sector stakeholders have the opportunity to input into the process. The stakeholder's input is communicated to the Government of Canada utilizing the templated Application (Application for Priority Assessment in the Course of an Emergency Event) which can be found on the following page. The Application provides a common tool that private sector stakeholders may complete to communicate information to the Government of Canada during an emergency that causes significant disruption to the normal flow of cross border trade at ports of entry. The Application contains fields for private sector stakeholders to populate information and identify people and goods they recommend to cross the border on a priority status and their rationale behind such a categorization (a critical economic, health or safety need). The information provided will then be used during the assessment of national priorities. As illustrated in the diagram below, private sector stakeholders who wish to apply for priority assessment of people and/or goods during an emergency should do so by completing the Application (next page) and submitting to their sector lead government department/agency. The sector lead department/agency may ask for additional information, but the information that is contained in the Application should be completed as a minimum. Included on the Application is a field entitled “Needed Within” which allows for private sector stakeholders to identify when the people and/or goods needs to be received in Canada (0 hours – 2 weeks) from the time the Application is submitted. Based on the evolution of the emergency and the needs within Canada, multiple opportunities may exist for private sector to submit a completed Application identifying new or updated recommended priorities to their respective lead federal government department/agency. 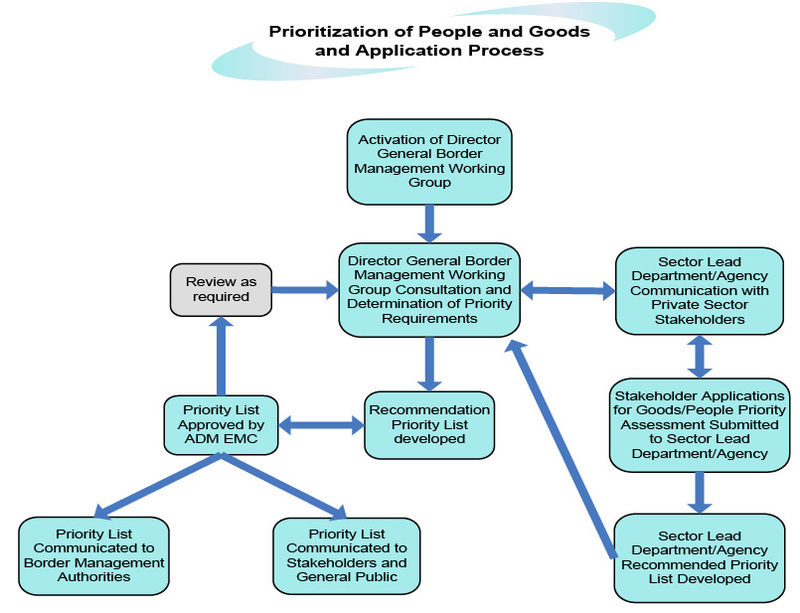 Representation of how potential priority people/goods are identified, the list of people/goods urgently needed in Canada is established and the results are shared with key stakeholders, beginning with the activation of the Director General Border Management Working Group. It is a flow chart with 10 labeled boxes linked by arrows. The chart is multi-directional. At each step, arrows point forward to one or more boxes and some boxes point back to the previous box. For further information, please contact your sector lead government department/agency. Your sector lead department/agency may request additional information, but the information contained herein should be completed as a minimum. *When multiple categories are chosen, please provide a “Rationale/Economic Impact” for each. During the course of a significant emergency event, the Government of Canada will make best efforts to provide fair consideration to all applicants who complete and submit an application for priority assessment based on the nature of the emergency at hand, Canada's overall requirements and any other criteria that may be relevant. The Government of Canada bears no liability for any adverse consequences economic or otherwise, that are perceived to be a result of a negative priority assessment. It is the obligation of applicants to complete and submit this document in full and in a timely manner. Incomplete and delayed applications may not be considered. Only those applicants who are identified as a priority will be contacted. The Emergency Support Functions (ESFs) listed above, which are included in the Federal Emergency Response Plan (FERP), provide the mechanisms for coordinating federal response actions in support of the needs that are anticipated to arise prior to or during an emergency. Each of the ESFs have a responsible federal government institutions whose mandated activities are most related to those set forth in the function or with the expertise to accomplish the task, including policies and legislation, planning assumptions and a concept of operations. In turn, these ESFs are used to augment and support the primary federal government programs, arrangements or other measures to assist provincial/territorial governments and through these governments, to local authorities or to support the Government Operations Centre in coordinating the Government of Canada's response to an emergency. It is important to note that this Plan is intended to complement, not replace, the roles and responsibilities outlined in the FERP, including those outlined in each of the ESFs to harmonize federal emergency response efforts with the provinces/territorial governments, non-governmental organizations, and the private sector. This Plan was endorsed and approved in 2009 by the Assistant Deputy Minister Emergency Management Committee as an annex to Canada's FERP under the ESF for Border Services. Therefore, the process must be undertaken in concert with the activation of the Border Services ESF and other ESFs under the FERP.